The summer is coming and as we begin to prepare for hurricane season we are reminded of the importance of being ready. Having already experienced the bands of our first storm of the season, Andrea. We plan ahead to make sure all our clients will be safe. 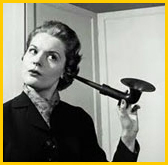 We have already reviewed our clients’ hurricane plans for where they live; have you reviewed yours? Just like many of our clients, we remember growing up and feeling safe with our parents. The role of our father was to help make us feel safe and secure. 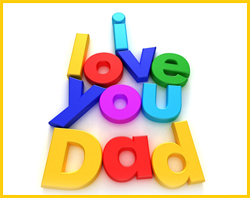 As we honor our fathers who take on this responsibility all the time we say thank you and we love you! As you read about a special reunion of one of our clients, you will know it is never too late to celebrate the bonds of fathers and their children. Through your donations and support of our events you provide the opportunity for us to serve clients like Henry who, while under guardianship, was reunited with his sister and daughters after 20 years. He now keeps in touch with them even though they live out of state. Henry’s news just keeps getting better as he has some of his rights restored and will be moving into an assisted living community from a nursing facility. Henry’s family never gave up on him and neither do we. Without your funding we could not have made this possible. 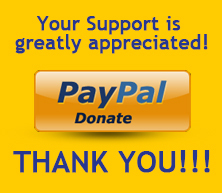 You also helped us by participating in the Ruby Tuesday GiveBack Program in May. Ruby Tuesday’s in Lauderhill gave back 20% of all meals that were purchased during your visits from May 29th-31st. We are planning to do this again in the future; so look for more to come! Helping comes in all shapes and sizes and we want to acknowledge two of our community partners who help us with recruiting volunteers. We all know that in today’s economy non-profits could not exist without our volunteers. Hands on Broward and Impact Broward are two agencies that recruit and place volunteers in the community. We appreciate how they help us staff our office with receptionists and other duties. We also use volunteers to help with planning our events, on our Board of Directors and other committees. You can help by contacting us or them for volunteer opportunities. clevine@monarchcare.org . A little help really goes a long way! On July 5, 1908, a West Virginia church sponsored the nation’s first event explicitly in honor of fathers, a Sunday sermon in memory of the 362 men who had died in the previous December’s explosions at the Fairmont Coal Company mines in Monongah; but it was a one-time commemoration and not an annual holiday. The next year, a Spokane, Washington woman named Sonora Smart Dodd, one of six children raised by a widower, tried to establish an official equivalent to Mother’s Day for male parents. She went to local churches, the YMCA, shopkeepers and government officials to drum up support for her idea, and she was successful. On July 19, 1910, the governor of the U.S. state of Washington proclaimed the nation’s first “Father’s Day.” However, it was not until 1972, 58 years after President Woodrow Wilson made Mother’s Day official, that the day (celebrated on the third Sunday in June) became a nationwide holiday in the United States. See the History Channel's website for more. MonarchCare has partnered with Family Signal to help you protect your children on Facebook, Twitter and Instagram. Follow this special protection link to try an incredible live demo. Please help us help your kids and share this with everyone! 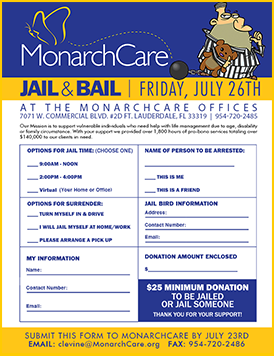 We have joined with the Mental Health Association of Southeast Florida to share with you the gifts of current and past clients of both organizations. 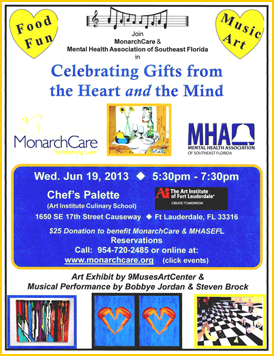 Join us on Wednesday, June 19th from 5:30-7:30PM at the Art Institute of Fort Lauderdale Culinary School. You can see and purchase the beautiful artwork from the 9Muses Center and listen to original songs performed from 6:30-7:00PM. There will be food, drinks and friends to meet. We hope you will join us by going to our Events page to REGISTER. Save the Date of Thursday, September 26th for our “Connectors Coronation” event, prior to which you will get an opportunity to nominate someone who goes above and beyond and who is not just a great networker but someone who is a great connector of people. You will then vote for your favorites and they will be crowned at this fun event. Look for more to come!! Daniel Fleischer, Esq. – Daniel T. Fleischer, P.A. Lawrence Levy, Esq. – Law Office of Lawrence Levy, P.A. Stephen Taylor – Suarez and Taylor, P.A. Gene Lipscher – Gene D. Lipscher, P.A.